Known as the Immortal Jellyfish, the Turritopsis Dohrnii, has an amazing ability. When threatened, sick, or injured it can revert back to an immature stage of life and start all over again. It does so by a process called transdifferentiation. 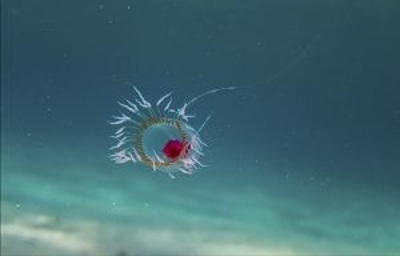 This jellyfish starts life as a larva. The larvae settle into a colony of polyps and ultimately bud off into individual organisms. During transdifferentiation one cell-type changes into something completely different. In this case, the jellyfish cells return to the polyp stage. And from that "child-like" stage, the jellyfish is reborn. In reality, most immortal jellyfish fall prey to other sea organisms or to disease. But in theory, there may be jellyfish of this species living in the ocean that have been there since the dawn of their kind. Scientists are studying these creatures not only to learn how cells might live longer, but also to help them understand the seemingly never-ending growth of cancer cells.